On May 4, 2016, Head of SMB, China Director of PayPal – Vince Lee and his assistant Chris visited the headquarter of ChinaDivision. Founder and CEO of ChinaDivision Ethan Chang and Head of Order Fulfillment Michael Chan cordially received the PayPal representatives and opened a discussion about cross-border e-commerce and the future cooperation with PayPal in terms of payment. At the beginning of the meeting, CEO of ChinaDivision Ethan Chang gave a brief introduction of the company’s development to the Paypal representatives. ChinaDivision is a B2B brand of CNstorm Co.,Ltd, who is dedicated to sourcing and shipping products to overseas Chinese globally, and obtained the Angel Investment by Shenzhen Creative Investment Group in 2014. 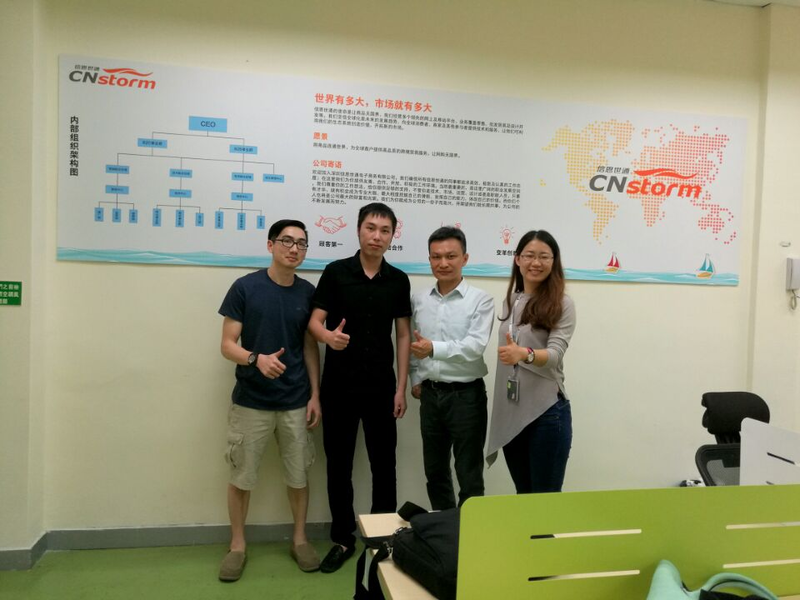 As a B2B brand of CNstorm, ChinaDivision is a leading provider of crowdfunding and e-commerce order fulfillment, recognized for China product sourcing, China warehousing and worldwide shipping from China services. For years cooperation with PayPal, ChinaDivision won high affirmation of Mr Vince Lee as an enterprise with innovative spirit and move with the times. During the meeting, both sides had a discussion about the current situation of cross-border e-commerce. It is believed that 2016 is till a time of challenges and opportunities. Traditional retailers, domestic and oversea e-commerce giants, start-ups, logistic service providers and distributors have all joined this battle trying to get a share of the cake. An analysis of the current situation is helpful to forecast the future and make plan for the next step of a company. Nowhere is the rapid expansion of e-commerce more apparent than in Asia. China is leading the way, shedding its identity as a production center and emerging as a burgeoning consumer market, with an increasingly affluent and populous middle class eager to embrace online technologies and chase for the developed world’s consumption styles. As a production center of the world, there is an increasing number of e-commerce merchants choosing China as product sourcing destination for their e-commerce business. China manufacturers or Chinese suppliers have become cross-border online merchants’ preferred business partners. A recent survey shows that cross-border e-commerce’s market size hit 4 trillion in 2014 and accounted for 15% of the total import and export trade volume of China. It is estimated that it will account for 23.1% by the year 2017. With the spread of smart phones and tablet computers, more and more consumers would like to shop by their mobile devices. Mobile devices make it possible to check orders and shipping status anytime. Affluent and well-educated young people make up the majority of cross-border online shoppers and the cross-border online shopping features at low frequency and higher spending per order compared to domestic online shopping. Its is unavoidable to face customs supervision and taxation during e-commerce transactions. Dissonant customs practices create significant uncertainties for shippers, which greatly reduce the efficiency of customs clearance. Logistics includes warehousing, picking, packing and shipping. It places the role as a bridge between the seller and the buyer in cross-border e-commerce. However, international shipping options are complicated by VAT, customs charges and others more. Shoppers will be discouraged by the price opacity. Consumers want shorter, more precise and more reliable shipping for their goods. However, some parcels are failed to be tracked or the tracking information lags the actual delivery. In this circumstance, the unreliable transit time constitutes an obstacle in cross-border e-commerce. As the core of cross-border e-commerce, e-payment involves safety of funds transfer. For one thing, in the process of information transmission, payment information will be loss due to a system failure. For another, there are lawbreakers who use computer technology to steal payment information illegally. When people are deciding whether to use cross-border payment, they are subject to safety, rates, efficiency and personal payment habits. Among all of this, safety is the most important factor. According to a survey conducted by PayPal, Vince Lee said, more than 40 percent of consumers believe that “the premier security system” is the main reason why they firmly use PayPal as the cross-border e-commerce payment tool, while 80 percent of consumers finally complete their cross-border transaction because of the trust of PayPal’s Buyer Protection Policy. As PayPal’s long term business partner, Ethan said that ChinaDivision will continue to work with PayPal to provide our customers with a better payment experience and create a more safety payment environment. It is based on the current situation of cross-border e-commerce and the challenges it exists that ChinaDivison creates a new business model – providing China sourcing, warehousing and shipping services to e-commerce businesses. During the meeting, Ethan and Michael shared this new business model to PayPal representatives. As the world’s factory and production center, almost anything can be bought in China with multiple choices and fair price. But due to languages and time difference, it may not be such an easy thing for most online sellers. Considering the importance of inventory souring, ChinaDivision makes the most of its favorable location in Shenzhen, China. Applying tactical local sourcing strategies and collaborating with China-based factories and industry alliances, ChinaDivision is skilled in managing Chinese suppliers and has abundant high-quality sourcing resources at command, so with millions of products manufactured in China we can get you connected and assures product quality with competitive prices. When it comes to start an online business, a variety of fixed overhead could have discouraged many people. Renting a warehouse, purchasing facilities, hiring workers etc, all this are costly and sometimes are wasteful when it happens to be off-season. ChinaDivision provides China warehousing services, allowing activities such as inventory receiving, repacking, weighing and quality check to be carried out on products before shipping to the customers. What’s more, free warehousing for 30 days is offered, no minimums, no set up fees, thus start-ups and small size business will not be blocked out. Just as mentioned above, with the emergence of cross-border e-commerce, traditional retailers, distributors, logistics service providers etc., all join a battle for the share of this cake. However, as an order fulfillment agent in China, ChinaDivision not just serve clients in one way, but take the whole situation into account, thus clients in ChinaDivision can enjoy a one-stop solution, from warehousing to shipping. With the good connection with famous international couriers, ChinaDivision ships goods worldwide to customers fast, easy and affordable. To enhance service of delivery, ChinaDivison also has a system that allows any order to be tracked in real time. This contributes to convenience and efficiency thus leading to a great customer experience. At the end of the meeting, Vince Lee kindly asked the problems that ChinaDivision faced when using PayPal and opinions for its further improvement. Both sides also had a pleasant discussion about the future cooperation details. As one of the strategic partners of global payment leader PayPal, ChinaDivision is very honored to be chosen and visited by the top of PayPal and will continue the good cooperation with PayPal and other payment giants.